Stayton City Hall is located at 362 North Third Avenue, Stayton, OR 97383; phone: 503-769-3425. Photo: Charles and Martha Brown House, ca. 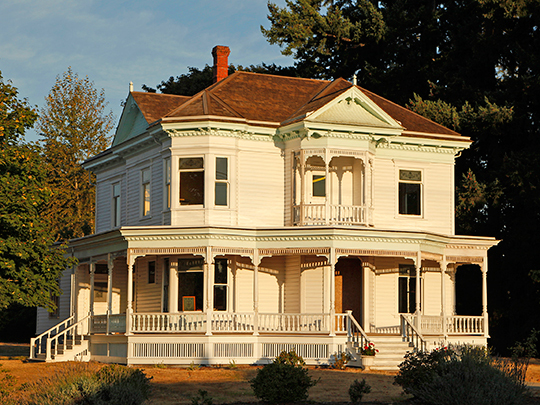 1903, 425 North First Avenue, Stayton, OR. Listed on the National Register of Historic Places in 2002. Photographed by User:Joangray (own work), 2012, [cc-by-3.0 (creativecommons.org/licenses/by/3.0)], via Wikimedia Commons, accessed March, 2014. In 1866, Drury Smith Stayton, an early resident of the community of Sublimity, Oregon, purchased 41 acres of heavily forested land near the North Santiam River, about two miles south of Sublimity. The land had originally been part of the Donation Land Claim (DLC) of Stephen Porter but at the time of the sale was owned by James Lynch whose DLC bordered Porter's on the west. Ten years before Stayton's transaction with Lynch, a group of Salem, Oregon entrepreneurs had acquired an easement across Lynch's property to dig a ditch to divert water from the North Santiam into Mill Creek, a seasonal watershed that runs through a valley between Sublimity and Stayton. Mill Creek empties into the Willamette at Salem and had been used by the early settlers of Salem for waterpower. The enhanced stream flow from the successful 1857 Salem Ditch diversion permitted Salem to build larger water-powered mills with the expectation of year-round operation. While giving rise to several mills in Salem including the Willamette Woolen Manufacturing Company and the Thomas Kay Woolen Mill, these diversions point to the significance that water power held for Stayton as well as other communities in the Willamette River Valley. Drury Stayton's plan was to create a similar but shorter diversion of the river to provide water power opportunities on his newly purchased property. He and members of his family began digging the necessary ditches and by 1868 had a small water-powered wool carding plant in operation followed in 1870 by a sawmill. A six-block town site was platted, named and given a post office in 1872. By 1878, six water-powered industries were operating on the Stayton Ditch and the town had a population of around 300. More or less paralleling the growth of the town was an increased use of Stayton as a place to cross the North Santiam River. Ferry service was available from at least 1870 and an inter-county bridge was completed in 1889. Stayton's 1st Ave. is the north-south road leading to the river crossing. By 1878, a fairly comprehensive and yet primitive road network had been established in Marion County. Stayton was advantageously situated within this network at the intersection of two important roadways. Stayton's 1st Ave., for instance, is connected to the older town of Sublimity via the only foothills north/south route on the east side of the Willamette Valley. This route is now called the Cascade Highway. Washington Street, situated four blocks north of the original town grid, was the only Marion County route leading from Salem to Mehama and into the Cascade Mountains. While Stayton was located at a strategic road intersection, it had the misfortune of being largely bypassed by the early railroads. During the 1880's north/south and east/west rail lines each missed Stayton by several miles. Goods shipped by railroad had to be picked up and hauled up to ten miles from the nearest rail links in Kingston and Turner. The lack of immediate rail service was a serious disadvantage for the town's industries and arguably hindered its development. While larger communities such as Salem and Albany were comparably well served by railroads and road networks, many smaller Willamette Valley communities, such as Scio and Lebanon, were completely missed by the railroad. In response to railroad alignments, some communities, like Jefferson and Shedd, relocated themselves entirely, while others such as Silverton constructed narrow gauge rail connections to larger trunk lines. The residents of Stayton never took the rather drastic and expensive steps of relocating their community or building a trunk line (at least until 1965). Serviced by good network of roadways and plentiful sources of water power, Stayton was able to weather economic strains while others failed. Despite these shortcomings, Stayton still drew merchants to service the various industries in town and the people who worked there. In 1871 a young Sublimity man, W. H. Hobson, set up a general merchandise store in a vacant building near the Marion County side of the Santiam ferry crossing with the intent of disposing of some merchandise his father had taken to satisfy a debt. Business was so brisk that Hobson soon relocated his store onto one of the Water Street lots of the new town of Stayton and continued as a storekeeper, in various locations, for 40 years. Other merchants and providers of service soon followed. Ernst Lau and Gregg Olson, Santiam Heritage Foundation, Historic Downtown Area of Stayton, Multiple Property Submission, nomination document, 2006, National Park Service, National Register of Historic Places, Washington, D.C.